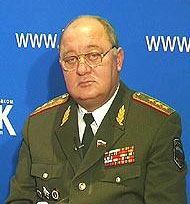 A Duma member since 1999, Arkady Baskaev is presently a member of the Committee on National Security. Besides that, he is a member of several ministries of the Moscow Government and President of the Fund of Social Protection of Military Servicemen and Their Families. Prior to his election as a Duma deputy, Mr. Baskaev devoted his career to the military services. His portfolio includes the post of the First Deputy Main Chief of the Internal Forces under the Ministry of Internal Affairs, Deputy Commander of Federal Forces in Chechnya, the Commandant of the White House in Moscow and various posts at the Internal Forces of the Russian Federation. Arkadiy Baskaev graduated from the Frunze Military Academy and the Ordzhonikidze Military Institute of the USSR. He holds a doctorate of law. Arkadiy Baskaev honored with several orders and medals.